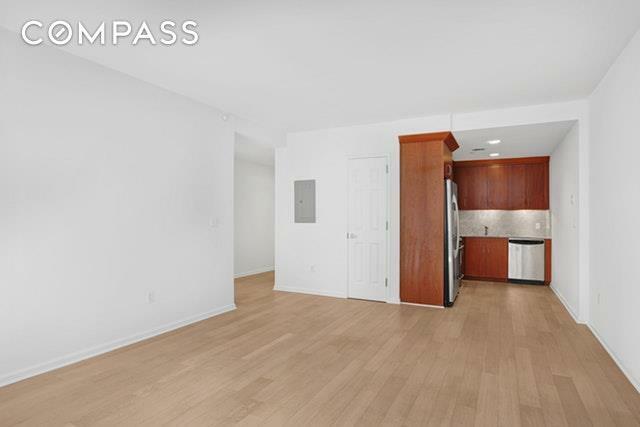 Located on a quiet, tree-lined street, at the nexus of the established and burgeoning neighborhoods of Boerum Hill, Fort Greene, Park Slope and Prospect Heights, this beautiful 2 bedroom, 2 bathroom doorman condo offers the best in convenience and serenity, making it the perfect place to call home! With a south-facing exposure, this apartment also features its own private balcony that looks upon a beautiful courtyard.Its layout features a proper foyer and a spacious open living & dining area. The apartment was recently renovated with wide plank, wood flooring and Kohler sink and vanities featuring Grohe fixtures. The beautiful modern kitchen has a rich Mahogany cabinetry, below cabinet lighting, dark granite countertops, and stainless-steel appliances, including dishwasher. The separate bedroom wing features a large master bedroom with an en-suite bath complete with Carrara marble floors and walls, and a glass-enclosed shower. A well-proportioned second bedroom has a large closet and an adjacent full bathroom with Carrara marble tiles and a bathtub. 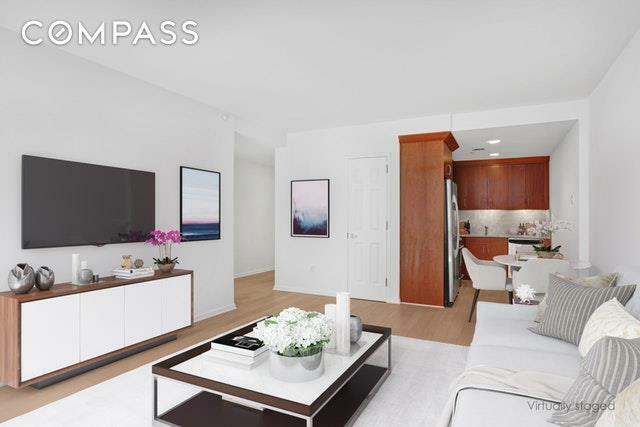 The Boerum Heights Condominium features a 24 hour doorman, live-in residence manager, a fully equipped gym that steps out onto a quiet, furnished courtyard and underground parking garage. 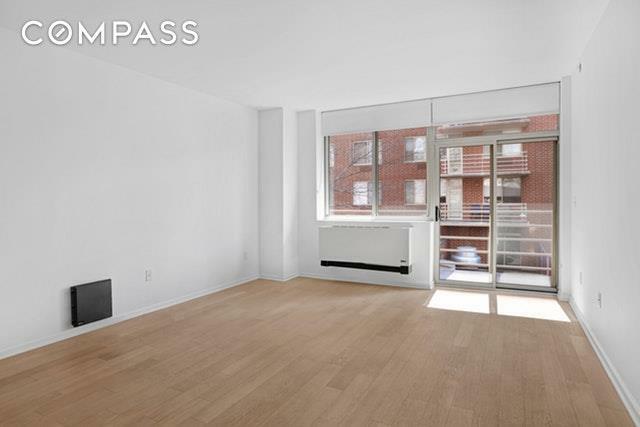 Low common charges and tax abatement until 2024 make this gorgeous apartment an excellent purchase! Its central location puts it among many wonderful culinary, cultural and nightlife options. 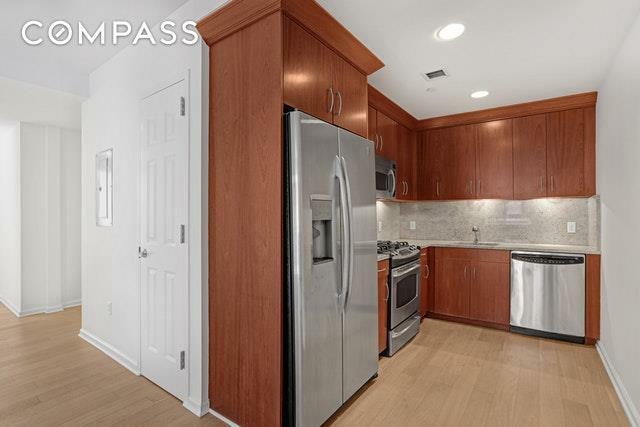 It is also just around the corner from the new Whole Foods 365 grocery store, Apple Store, Barclays Center, Brooklyn Academy of Music, and the Atlantic Terminal Mall with access to a multitude of subway lines (2,3,4,5,B,D,Q,N,R,W) and LIRR trains just a few minutes away. Listing courtesy of Jason Wang of Compass.